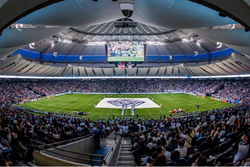 Corporate Travel Management Solutions (ctms), a global travel management company with an office located in Vancouver, has announced a new partnership with Major League Soccer’s (MLS) Vancouver Whitecaps FC. As part of this new agreement, ctms will become the exclusive travel management provider of the United Soccer League’s (USL) team air travel, boys under 18 and under 16 Residency team travel, Girls Elite REX team travel, club travel for the Canadian Championship and CONCACAF Champions League competitions, as well as all front office staff and executive travel. As a part of this multiyear deal, Whitecaps fans will be introduced to the ctms brand and suite of services via in-stadium advertising within BC Place as well as several website and digital ad placements. Vancouver Whitecaps FC were founded 42 years ago in 1974, making them one of the longest running professional soccer clubs in North America. Since their inaugural MLS season in 2011, Whitecaps FC have had plenty of success. In 2012, the ‘Caps became the first Canadian team to qualify for the MLS Cup Playoffs. In the 2015 season, Whitecaps FC hoisted the Voyageurs Cup for the first time after winning the Amway Canadian Championship, finished second in the Western Conference, and third overall in MLS. For more, contact ctms at 1-866-359-2867 or via email at info(at)ctmstravel(dot)com.